What This Website Can Do For You! Expansion Academy will be releasing numerous courses to help business owners reach their goals. We will keep you informed as these become available! Are you visible online to customers near you? Do want to know the simple steps to become so? This course is for business owners and executives who want to know the core concepts of local search and take immediate steps to improve their local search presence. 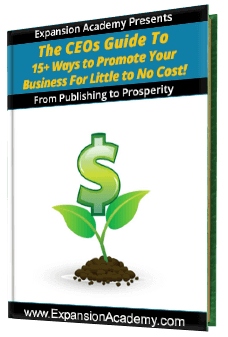 The CEO’s Guide to 15 Plus Ways to Promote Your Business For Little to No Cost! Concerned about the cost of promoting your business? Look no further than these great tips to improve your business visibility on the cheap! What are the core elements to having a business website? What should a website be doing…and is YOURS doing it? Find out in this vital business marketing training. You probably don’t need to be told that online video is a vital way to reach customers (but we’ll show you some jaw-dropping statistics anyway! )…so are YOU taking full advantage of video in your marketing actions? Getting your video online, and noticed! From the social platform du jour to, more importantly, how to USE social distribution sites, this training gives you a bird’s-eye-view of the social environment.